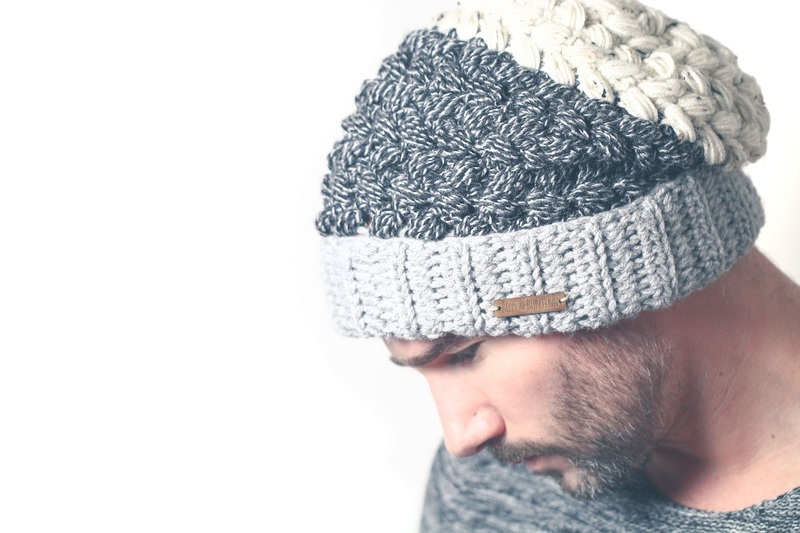 I know it's been out already for over a week and the blog is always the last place that gets updated, but I'm finally here to write about the Greystoke Hat Pattern Release! As an apology to those of you who don't do social media and only follow us on our website, I'm giving you guys a discount code at the bottom of this post. After a very successful response to the Greystoke Cowl, I knew I wasn't quite done with that stitch pattern yet. I couldn't get enough of those unusual criss cross puff stitches. The texture it creates is absolutely wonderful. I wanted that texture to stand out even more by combining it with another stitch pattern. That's why I came up with the pattern for this hat. A bold but very neat looking foldable brim as the groundwork for the textured pattern to build up from. Even though I loved the look of the grey, dark grey and black for my cowls, I knew I wanted to try and use a different yarn for these hats. I always struggle finding the right yarn for my patterns, and sometimes it really puts me off and occasionally I'll completely give up on a design because I can't find anything that works with the idea in my head. I strolled through the city and went to all the yarn shops hoping to find what I was looking for. Crazy enough, I ended up buying a yarn that I never even considered buying before. I had seen it before but only in very bright and neon colours. It's also very inexpensive! I never knew that they had also started to make some more muted colours, and even some tweedy looking versions! I've always had a soft spot for tweed! I picked up these 3 colours and knew right away that it was going to be perfect. Or not? There was actually a problem. The yarn was DK weight. No way I was going to make a big slouchy hat with DK weight yarn. First of all it would take forever, and second of all, I wanted my stitches to have quite a strong textured look to them, which is better achieved with a heavier weight yarn. So, what to do? This was the best yarn I was going to find here in Hamburg, and I didn't want to order any online as I love to see the yarn before I buy it. Well, there was only one solution: Double Up! Using a 6mm hook (J hook for US readers) I went to work on this pattern. As I started making the brim, I was so happy with the thickness of the stitches. They were plump and beautiful! The hook size and double strand of yarn were a match made in heaven! The way the two strands just melted together made it look like a beautiful single strand of thick yarn! Moving on to the body of the hat with all the puff stitches, I loved how fast it started to build up. Why had I never considered using two strands before? 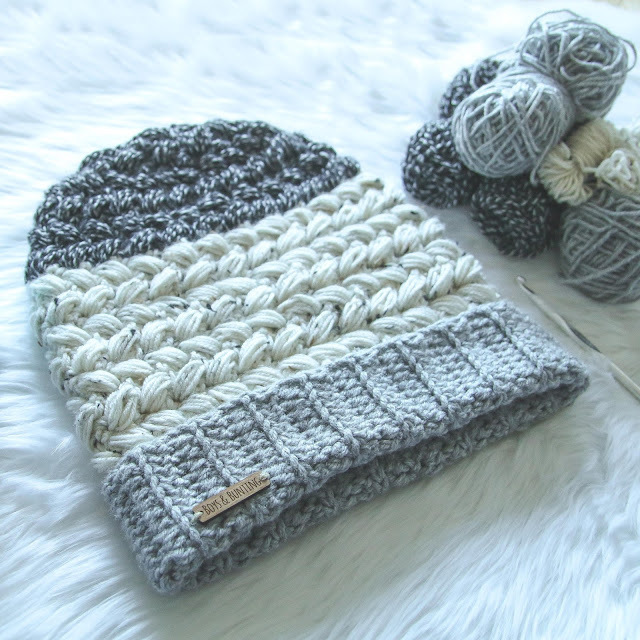 It really creates such a beautiful puff stitch! The way the stitches slant and almost cross each other also makes for a very warm and windproof hat! I finished my first version in no time at all, and was instantly happy with it. The colours, the pattern, the way it looked on my head, it was all perfect to me! Sometimes I go through many prototypes before I'm happy, but not this time. It just felt right. To be absolutely sure I did make another couple of hats, to really get the pattern in my head. It helps me to be very sure about the complete process of making it and how to explain to you guys how to make it in the pattern. I also popped our little wooden label on there (from JSLASERCRAFT on Etsy) to give it the final touch! The colours I bought are: Natur Tweed, Graphit Mouline and Hellgrau Meliert. It's a little bit cheaper in Germany than it is on the international web shops, but the price is still quite low! 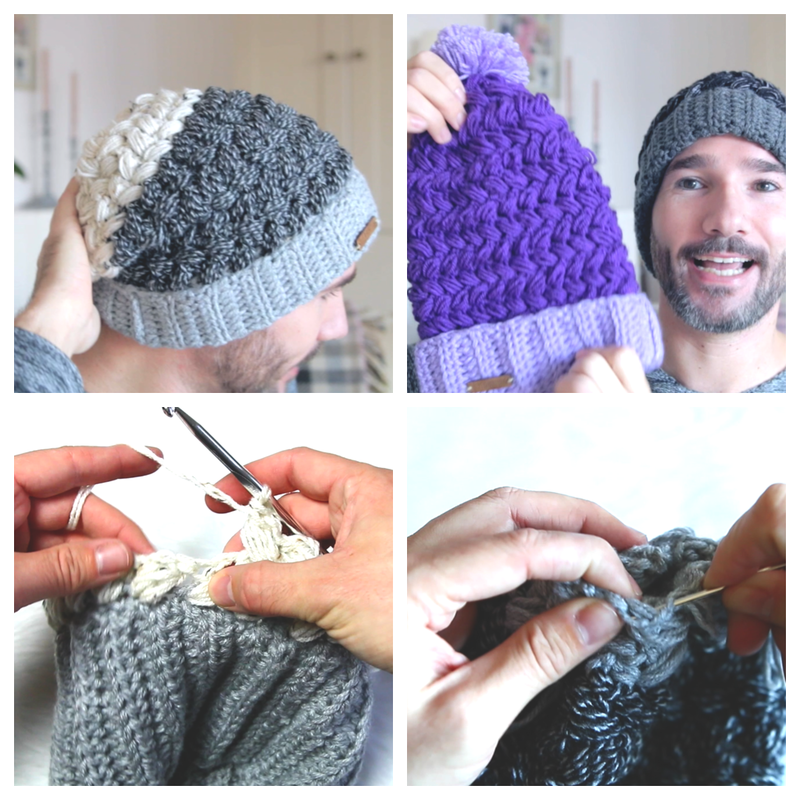 As the pattern has been out for over a week now, a lot of you guys have already made a lot of these hats, and the feedback for the video tutorial has been crazy positive! Most people don't even bother reading the pattern anymore as every single step and bit of information is there in the video. Here you can see some screen caps from the video. I show you a slouchy version, a fitted beanie version and even a kids version! I also explain how I made the different versions! I was so excited to share this pattern with you guys! I had to force myself to be patient and not reveal too much about it as I was creating it. Once an idea is born and my first prototype is ready, it's still a long road to release the pattern. Making multiple test versions, have the pattern tested, planning a day for filming, another day for editing. Designing and editing the PDF pattern, and so on. I really love taking all those steps to create something that you can use without getting frustrated. I remember as I started to crochet, how upset I'd sometimes get with patterns. Sometimes too many assumptions would be made about things that might not be logical to you. That's why I like to leave as little as possible to the imagination. Therefore I believe a video is the perfect way to explain things! The pattern is available to purchase on both Etsy and Ravelry! 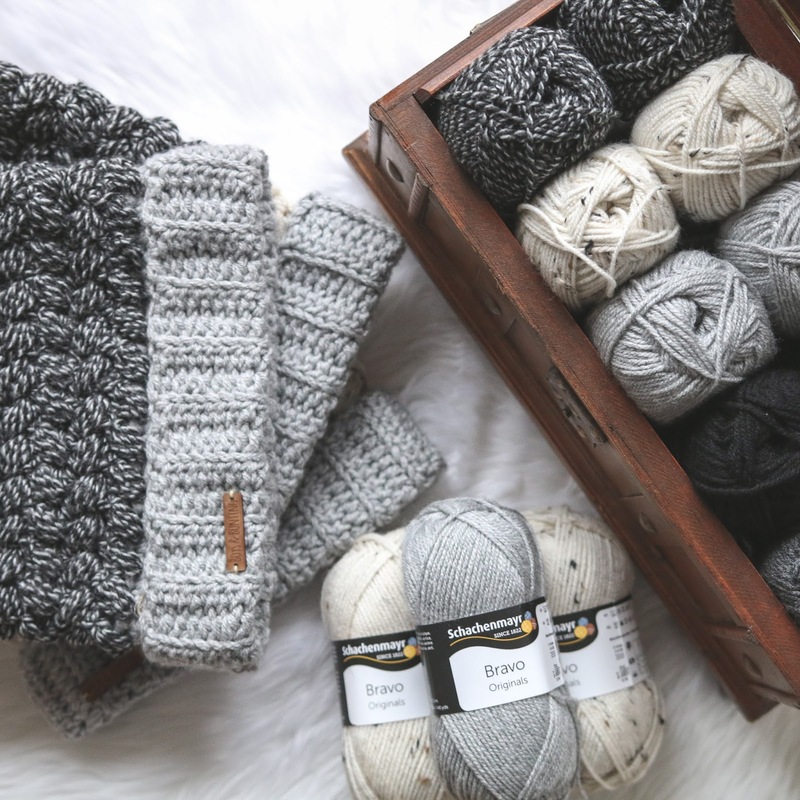 On Etsy you can even get a package deal when you buy the Greystoke Cowl & Hat together! Like I wrote above, I feel bad that I'm posting about this hat so late on our website! As Christmas is almost here and as an apology, I'm giving you all a discount code to use until the 26th of December at midnight (EST). It's valid as off now (22nd of December). 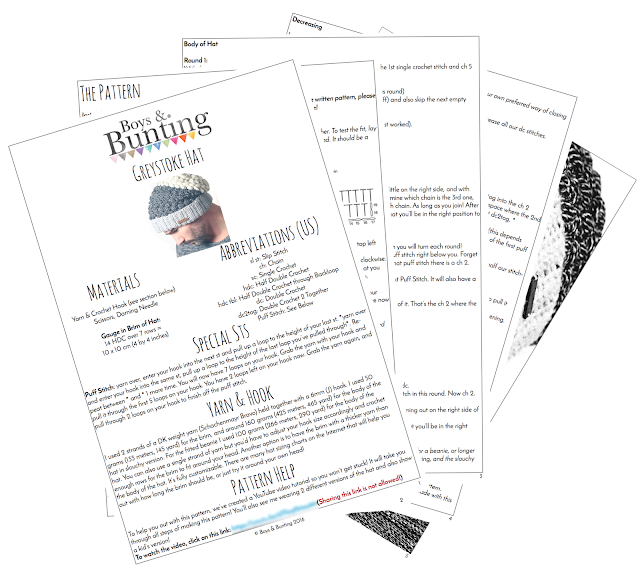 You will get a 15% discount on all our patterns on both Etsy and Ravelry! The discount is also valid for the package deal which is already at a lower price than the individual patterns! You guys have all been giving me so much positive feedback on Facebook and Instagram over the last week! It's also been very exciting to already see so many of your finished hats! 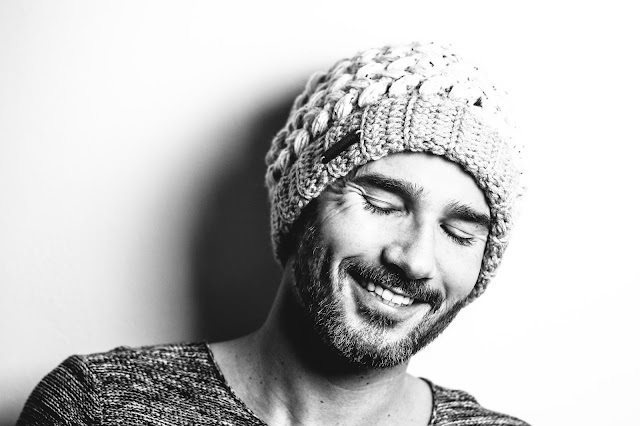 It really warms my crochet heart to read all your comments, and I do read ALL of them! Here's Matt's sister Hannah sporting a Greystoke Hat! I hope you're all having a wonderful time leading up to the holidays! Matt and I both want to wish you all a very Merry Christmas! We hope you get to spend it with the people you love. Christmas is always a great reminder to be kind to one another. I notice myself smiling as I walk through the city every day, people seem cheerful and everything is so beautifully decorated. It truly is "the most wonderful time of the year". 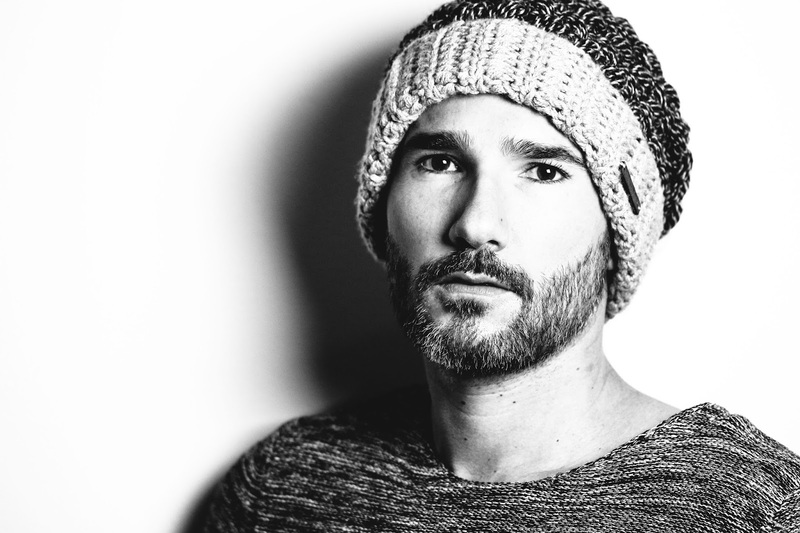 Love the hat and the color combinations, thanks! This hat is freaking gorgeous. I'm adding it to my list of things to make when summer is over in Australia.